Often the most useful tools are the ones developed by the people that use them with their own hands. In this section I've gathered various documents, outlines, histories, ideas, and other tools developed by Venturing Leaders for use in their roles as Advisors, Commissioners, Trainers, Recruiters, and/or Administrators. 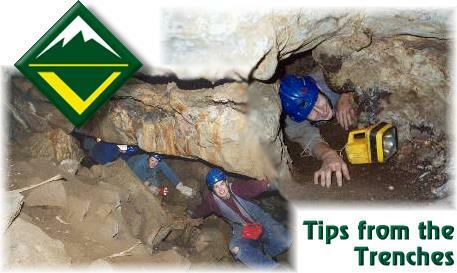 If you have a 'Tip' to share, please contact Craig Murray at TheHiker@SageVenture.com. These theses show the contributions made by a few scouters with the hopes of inspiring others to tackle some legitimate "problem/challenge statements" that can be worked on through either individually or collectively. Troop to Crew Transition by Charlie Eubank, 2004. Starting New Venturing Crews by Forest Getter, 2007. Retaining our Young Men in Scouting by Craig Murray, 2011. If you are interested in conservation, this paper will provide you with scout awards that work well in combination with each other. This is a series of articles providing information on awards outside of Venturing and their relationship with Venturing. Amy DeFrancesco, 2005-06 National Venturing President, benefited from hard work in these areas to receive a scholarship to the university of her choice. I wrote this one pager a number of years ago but I thought is was worth sharing because of an article in the Los Angeles Times entitled "Death on the trail" which was about scouts that died while hiking. When Bill was still involved in Venturing, he passed these files to me. This PowerPoint presentation is a briefing about how to guide Crews so that they set challenging but realistic goals. The PowerPoint presentation provides insight into how you can begin the planning process now that you have been trained. Do you know Scouters confused by all the "V-words" (Venture, Venturing, and Varsity)? This one page document briefly explains the differences between the programs and is a good tool to share with the general adult Scouter population. This is knowledge that everyone who's been through New Leader Essentials should learn, yet few seem to remember well. A one page brief outline of methods to keep boys in Scouting as they age with the use of the Venture and Venturing programs. Any troop which does not effectively retain its high-school-aged members should know about these methods. This one-pager is essentially a list of speaking points for presenting about Venturing to Commissioners, Professional Scouters, and District and Council level volunteers. It identifies specific challenges and opportunities Venturing presents, and gives the audience specific recommendations of actions to take. Rob, a Venturer, wrote this insiteful recruitment essay for the 2008 Philmont International Trek essay contest. It offers a great perspective on why and how young adults joining Venturing. This is a shared article from Jim Winters' Venturing Magazine. In the article, Jamie shares some lessons that her Crew learned in their three years of existence.